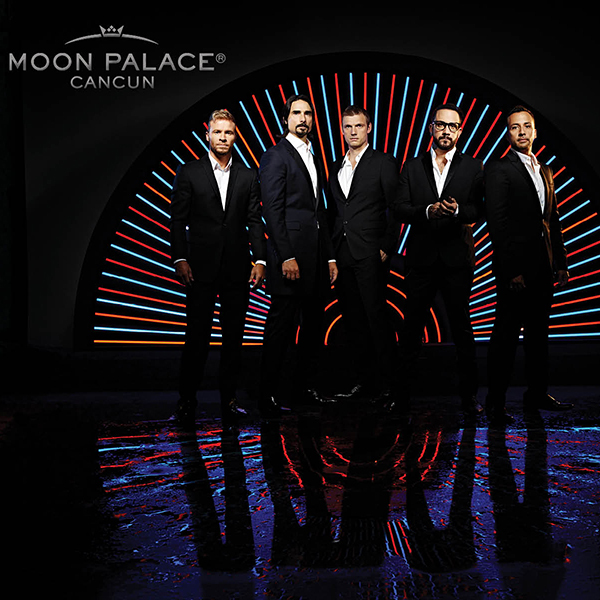 June 20, 2017 – Palace Resorts – the company that sets the standard in five-star, all- inclusive resort accommodations – is excited to announce its winter lineup: “Backstreet Boys: Larger Than Life” tour will close out the year at the brand’s signature property, AAA Four Diamond, Moon Palace Cancun. The show, which will take place on December 29th, 2017 at Cancun’s entertainment destination, featuring all five members — Nick Carter, Howie Dorough, Brian Littrell, AJ McLean and Kevin Richardson. In addition Moon Palace is also pleased to announce the return of The Illusionists – Live From Broadway™ this winter with a breathtaking new show The Illusionists 2.0. The limited engagement residency will come to life from December 22nd, 2017 through January 3rd, 2018. Both performances will take place at the Moon Palace Arena, a 140,000 square foot convention center, fully equipped with the latest technology and audiovisual equipment, which opened in 2014. Moon Palace Cancun has hosted performances by the Grammy Award winning band Duran Duran, The Cranberries, “ID” by Cirque Eloize, Usher, Ricky Martin and Enrique Iglesias, just to name a few. Their first international show since their Las Vegas residency, “Backstreet Boys: Larger Than Life” will perform for 7,000 fans their top smashes including popular hits such as, “Quit Playing Games (with My Heart),” “As Long As You Love Me,” Everybody (Backstreet’s Back)” and “All I Have To Give,” the band is sure to deliver an evening of pop magic. In all, the group has sold more than 75 million albums worldwide. Their first two U.S. releases both received the Diamond Award for sales of more than 10 million: “Backstreet Boys” in 1997 and quintessential “Millennium” in 1999, which reached No. 1 in 25 countries. For more than 20 years the Backstreet Boys, has continually delivered the finest pop music one has to offer. With countless #1s, record-setting tours, numerous awards and worldwide sales in excess of 130 million, BSB has been recognized as the best-selling boy band in history. Pricing for Backstreet Boys ranges from Bronze $89 USD- VIP $459 USD. Doors open at 7:00 p.m. and the pop harmonizing show will kick off at 9:00 p.m. The Illusionists is a fast-paced, mind blowing spectacular show, featuring the jaw dropping talents of seven of the most incredible illusionists on earth. They have shattered box office records across the globe and dazzled audiences of all ages, with a powerful mix of the most outrageous and astonishing acts ever to be seen on stage. The show is packed with thrilling and sophisticated magic of unprecedented proportions and non-stop action. Audiences will witness stunning performances of grand illusion, levitation, mindreading, and disappearance. The talented acts use inspiration from great illusionists of the past, such as Harry Houdini and pair it with a new and updated, contemporary aesthetic. The set and costume design include theatrical artistry that has rarely been seen before. Collectively, these performers have been seen by millions of people around the world and this production showcases their incredible talents together on stage for the very first time. The Illusionists 2.0 is sure to astonish. Pricing for The Illusionists 2.0 ranges from Gold $59 USD- VIP $139USD. The show is recommended for all ages. Doors open at 7:00 p.m. and the two-hour show kicks off at 8:00 p.m.
As an added incentive for families seeking world-class accommodations for the holidays, Palace Resorts guests will receive a special rate on show tickets and the possibility to book them in advance, beginning June 26th, 2017 by contacting toursinfo@palaceresorts.com. Palace Resorts has plenty to offer families, but now, kids and teens stay free on a luxury all-inclusive vacation everyone will enjoy. Families can bring kids age 17 or younger, and their kids’ stay is on the house. In addition, Palace Resorts guests who book a stay of five nights or more are privy to the most valuable vacation promotion on record – $1,500 Resort Credit, which can be used on spa and beauty salon treatments, golf outings, romantic dinners, wedding packages, and off-site excursions and tours. Palace Resorts’ all-inclusive accommodations start at $172 per person, per night, based on double occupancy. To reserve your stay at Palace Resorts, please visit www.PalaceResorts.com, call (800) 635-1836, or contact your preferred travel professional. For 24 years the Backstreet Boys, one of the most successful groups in music history, has continually delivered the finest pop music one has to offer, making them one of pop’s most influential performers. With countless #1s, record-setting tours, numerous awards and worldwide sales in excess of 130 million, BSB has been recognized as the best-selling boy band in history. In 2013, BSB celebrated their 20th Anniversary with the release of the album In A World Like This, which saw the group receive a star on the legendary Hollywood Walk of Fame, perform for the President of the United States, and make an unforgettable appearance in the Seth Rogen hit film “This Is The End.” Due to the overwhelming demand, the In A World Like This world tour was extended multiple times, amounting to what became the group’s biggest tour in over 10 years. On March 1, 2017 Backstreet Boys kicked off their Las Vegas residency “Backstreet Boys: Larger Than Life” in The AXIS at Planet Hollywood, and it has become one of the fastest selling residencies in Las Vegas history. BSB are currently working on their next album.